Novi, MI, October 19, 2016, Lynn Yenko Zoiopoulos, DO, FACC, FACP, Cardiologist at Fidelis Clinic and Cardiology consultant of Lynn Yenko Zoiopoulos, DO, Cardiology Consultants NW, has been recognized by Elite American Physicians, for dedication, achievement and leadership in cardiology. Dr. Lynn Yenko Zoiopoulos, DO, FACC, FACP, proudly serves as the Heart Failure Chair of Mid America Cardiovasular Consultants, a medical center that provides advanced cardiovascular health care. Boasting nearly 30 years of experience in the field of cardiovascular care, Dr. Zoiopoulos has treated women with cardiology problems including diabetes, asthma and compounding heart issues. Currently, she works as a consultant with other physicians with regard to their patients’ heart conditions, specifically heart failure. Prior to joining Mid America Cardiovasular Consultants, Dr. Zoiopoulos worked as an associate staff member of Northwestern Memorial Hospital, The Western Pennsylvania Hospital, Suburban General Hospital, and North Hills Passavant Hospital, Pittsburgh. In addition to her work experience, Dr. Zoiopoulos is thoroughly well-educated, even when considering the already high standards of her field. Among her many educational achievements are a fellowship in cardiology, which she completed at Northwestern University Medical School in 1994, a residency in internal medicine, which she completed in 1984 at The Western Pennsylvania Hospital, and her Doctor of Osteopathic Medicine, which she earned through the West Virginia School of Osteopathic Medicine in 1984. 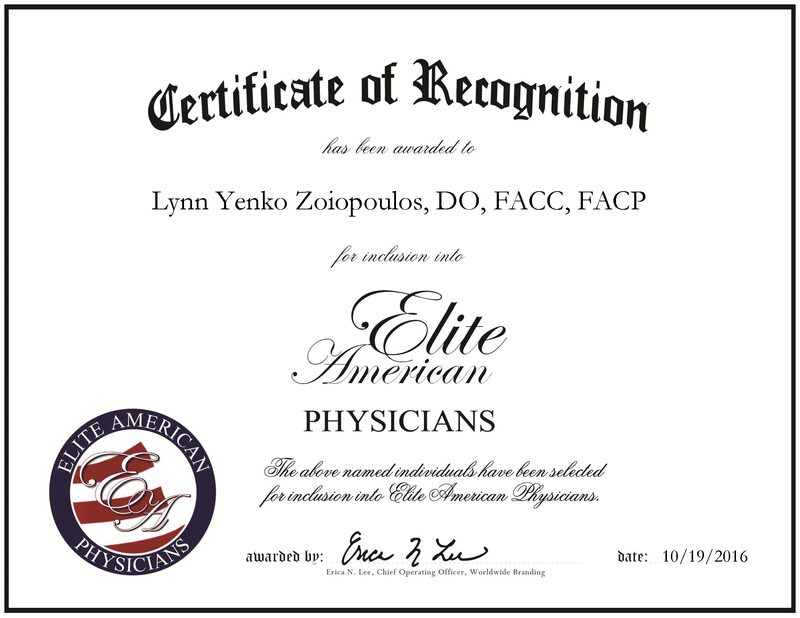 Lynn Yenko Zoiopoulos was originally selected for inclusion in Elite American Physicians in 2011. We are proud to be featuring Dr. Zoiopoulos again in Elite American Physicians for 2016. This entry was posted in Cardiology and tagged Cardiology, cardiovascular medicine, consultant, heart failure, internal medicine. Bookmark the permalink.